The 30th May was no ordinary day for the shipyard in Bordeaux. 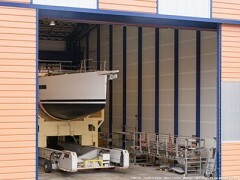 The hangar’s huge doors opened early in the morning to disclose the new silhouette of the first CNB66, the largest yacht maneuverable without crew in the semi-custom line from CNB yacht builders. After her launching, the CNB 66 No.1, named Althane, made her first rounds in the water at high tide under the watchful and amazed eye of her designers. All were present to admire the fruit of their thousands of hours of work. The style of the CNB 66 shares the semi-custom line’s DNA: an elegant and sporty profile underlined by modern curves with a special feature for this refined yacht, her bowsprit. Made of high-tech carbon and resin composite, the latter reflects the will of the shipyard to make the boat even swifter, especially in light winds. This element, drawn by Philippe Briand, fits perfectly into the design of the boat while concealing the mooring in a harmonious and practical way. The next day was devoted to the final stage of this “ oll-out”: the mast stepping. The vertical carbon mast, guided by the technicians, was gradually brought to its housing. Once the mast was laid, the shrouds, forestay and the in-boom furlers fixed. CNB 66 No.1 is now ready for the testing phase. Althane will soon be heading to La Rochelle for her certification testing and last fine-tuning before conveying to the Mediterranean. You will be able to discover her at the Cannes Yachting Festival from 12th-17th September 2017. For more information on the CNB66 or to make an appointment to view the boat in Cannes next September, Contact Ted Smith.